ruthdelacruz | Travel and Lifestyle Blog : I Loove Pin Ups!!! Right, I love the Hed Kandi artwork and Jordi Labanda's sketches. Add to my crazy taste in art are the Pin Up Girls! For a moment I thought of having my pic taken Pin Up-y way. I was browsing multiply when I found these lovely necklaces! I sooo wanted to fill out the Order Form but I know I have to think twice and think of my expenses! Please check out Yellow Daisies to order these pieces. 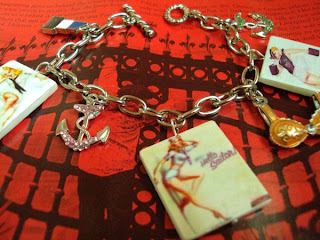 I hope by the time I already have money to spend, these neclaces are still available. Price is at Php1,200. Don't forget to visit the BackstageVamp for Graphic Pin Up Bracelets too! Price ranges from Php350 to Php450. © ruthdelacruz | Travel and Lifestyle Blog : I Loove Pin Ups!! !